When your child is threatening a meltdown in the grocery aisle, is it really possible to keep your cool, correct the behaviour, and reinforce healthy development, all at the same time? 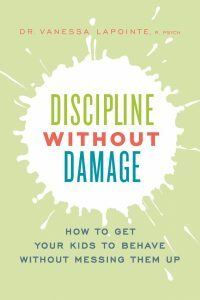 In this easy-to-read, science-based book, parents, caregivers, and big people of all kinds will discover how discipline affects children’s development, why intervention should reinforce connection, not separation, and why the disciplinary strategies that may have been used on us as children are not the ones that children really need. On sale Fall 2019. Pre-orders available now! Through the twin lenses of attachment parenting and the most up-to-date child development research, Dr. Lapointe walks parents through the battlegrounds where problems are most likely to arise for children—sleeping, feeding, toilet training, aggression, sibling rivalry—and she provides appropriate solutions designed to promote connection and growth. 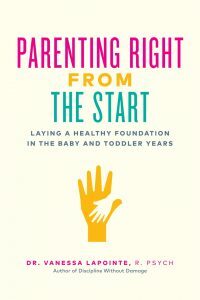 Rooted in compassion and understanding, Parenting Right From the Start shows parents how building a firm, caring presence in the early years is one that a child can lean into for a lifetime.